This infatuating lip lacquer effortlessly glides on and delivers extreme creamy comfort, featuring a unique liquid varnish that melts onto the lips and paints them with reflective shine and pure, vibrant colour. Six provocative shades make a searing statement without any tackiness, fading or feathering. Using the wand applicator, glide lip varnish across the lips. 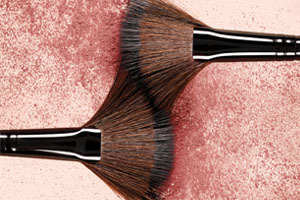 Apply lightly for sheer coverage or layer for more intensity. Polybutene, Octyldodecyl Stearoyl Stearate, Triethylhexanoin, Triisodecyl Trimellitate, Vp/Hexadecene Copolymer, Isocetyl Stearate, Diisostearyl Malate, Silica Dimethyl Silylate, Pentaerythrityl Tetraisostearate, Glyceryl Behenate/Eicosadioate, Phenylpropyldimethylsiloxysilicate, Flavor (Aroma), Tocopheryl Acetate, Diethylhexyl Syringylidenemalonate, Caprylic/Capric Triglyceride. May Contain/Peut Contenir/(+/-): Ci 77891 (Titanium Dioxide), Ci 77491, Ci 77492 (Iron Oxides), Ci 45410 (Red 28 Lake), Ci 42090 (Blue 1 Lake). Ingredients Polybutene, Octyldodecyl Stearoyl Stearate, Triethylhexanoin, Triisodecyl Trimellitate, Vp/Hexadecene Copolymer, Isocetyl Stearate, Diisostearyl Malate, Silica Dimethyl Silylate, Pentaerythrityl Tetraisostearate, Glyceryl Behenate/Eicosadioate, Phenylpropyldimethylsiloxysilicate, Flavor (Aroma), Tocopheryl Acetate, Diethylhexyl Syringylidenemalonate, Caprylic/Capric Triglyceride. May Contain/Peut Contenir/(+/-): Ci 77891 (Titanium Dioxide), Ci 77491, Ci 77492 (Iron Oxides), Ci 45410 (Red 28 Lake), Ci 42090 (Blue 1 Lake).